← A sign from a cross? Why would a Catholic nun advance a “pro-life” view against the death penalty while refusing to speak against killing innocent children by abortion? I have asked myself this question repeatedly over the past several days while searching for quotes from Sister Helen Prejean, who is speaking in Bakersfield later this week. Although I am not a member of a Catholic church, I have a high respect for many Catholic teachings, and particularly appreciate the Catholic Church’s long record of consistency regarding life issues such as abortion. Some have responded to this controversy by emphasizing that Prejean’s calling is to speak out against the death penalty, not to speak out against abortion. While I doubt that anybody would expect Prejean to talk more about abortion than the death penalty, it seems to me that when she totally ignores abortion, her message becomes fatally unbalanced, especially in view of the official Catholic position on these life issues. I expressed my concerns about Prejean to Bishop Armando Ochoa and several local priests, including Msgr. Ronald Swett, who is hosting Prejean at St. Philip’s. None of the priests I contacted expressed any opposition to Prejean. 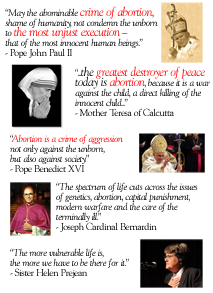 To put Prejean’s refusal to address abortion into perspective, I prepared this document quoting several important Catholic voices. The document concludes with a quote from Prejean herself: “The more vulnerable life is, the more we have to be there for it.” While perhaps Prejean did not originally intend for her quote to be used in reference to abortion, isn’t it appropriate to consider whether innocent children in their mothers’ wombs are in fact more vulnerable than convicted criminals on death row? If so, isn’t Prejean violating her own principles by failing to “be there for” the victims of abortion? The Catholic church makes important distinctions between abortion and the death penalty: abortion is an “intrinsic evil” and is one of the “five non-negotiable issues.” The death penalty is not considered to be an intrinsic evil, nor is it considered to be a non-negotiable issue. There may be a legitimate diversity of opinion even among Catholics about waging war and applying the death penalty, but not however with regard to abortion and euthanasia. Even during her visit to Bakersfield this week, Prejean plans to speak at a pro-abortion church (First Congregational Church, which is part of the United Church of Christ, a strong supporter of abortion since 1971). If she follows what appears to be her typical speaking pattern, she will not say anything to challenge the views of these “Christian” abortion supporters. Because of Msgr. Swett’s statement that he has been receiving overwhelming support for hosting Sr. Prejean, it may be appropriate to tell him if you object to Prejean’s invitation to speak at St. Philip’s (especially if you are a member of St. Philip’s). If you are interested in helping promote a balanced pro-life perspective to those who plan to attend Prejean’s Bakersfield speaking engagements, please contact Joel Torczon (661-665-2316 or jtorczon -at- aol.com). It appears that Sr. Prejean makes no distinction between an innocent child in the womb and a criminal who has done the horrific act of premeditated murder. And she apparently does not know her Bible about the punishment for premeditated murder. I can’t help thinking that, in some bygone day, she may have been very close emotionally to someone who had an abortion (maybe one of her own?) and is trying to justify the action.